This recipe is my chia pudding breakfast bowl. Before I start it seems like its been months since my last post… well its true actually last time I posted on my site was february… how embarrassing! alot has happen since then, two whole seasons passed, spring and summer and now we are heading out into fall, whole lot of pumpkin spice and sweaters are on it’s way here in Montreal. 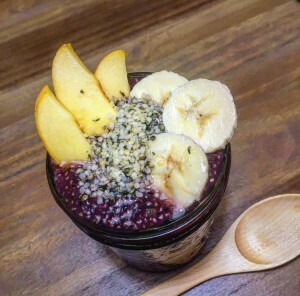 I find the colder it gets outside the harder it is for me to wake up early and prepare breakfast, this chia bowl is great grab and go idea because I prepare everything the night before and stick it in the fridge overnight to let it set. You will need 1\4 cup of chia seeds. 1 and 1/4 cups of water (or almond milk) and any sweetener of your choice I used coconut nectar. this is the base to your overnight chia bowl. with this I’ll usually add about 1/3 of a cup of blueberries into my blendtec and half a banana and I’ll puree it. I mix everything together and separate it into two mason jars of 500ml then I’ll slice the remaining banana and add in tablespoon of hemp seeds to each jar. Than slice up a peach add that in and just close the jar stick it into the fridge. VOILA its done breakfast will be ready for tomorrow and the day after or your spouse. In my case my husband will have a healthy breakfast as well LOL.